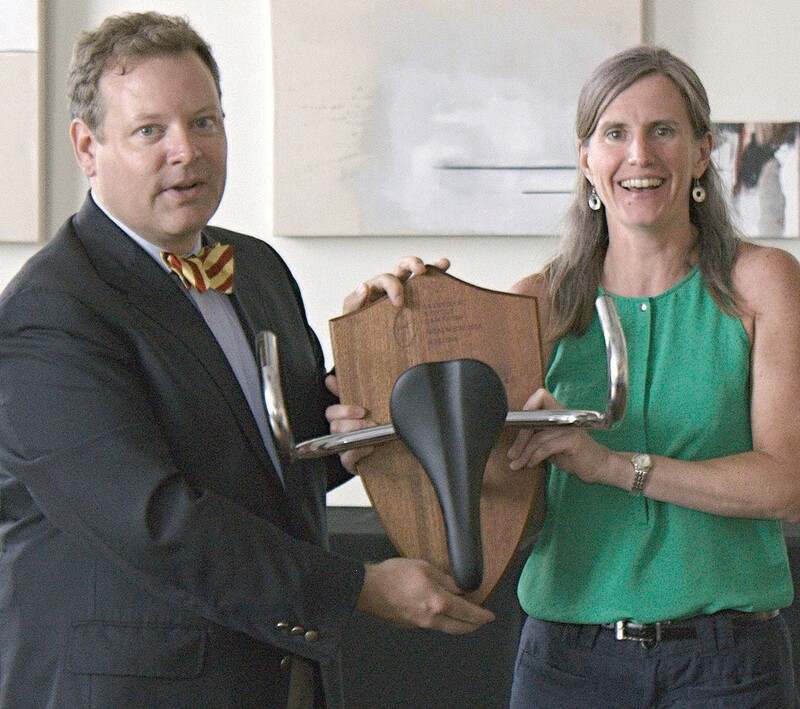 Each year, the Savannah Bicycle Campaign (SBC) recognizes someone in the community (not on the SBC Board of Directors) who is helping to improve bicycling in Savannah. The recognition is the Pedal Medal award. This year the award was presented to Jane Love on May 15, 2014, in appreciation of a several activities, as related to her position at the Chatham County -Savannah Metropolitan Planning Commission. Love’s department supports the transportation planning process of the Coastal Region Metropolitan Planning Organization (CORE MPO).Among the activities included were: organizing and analyzing annual bicycle and pedestrian counts; maintaining maps of existing and planned bikeway facilities, and updating the MPO’s adopted “Chatham County Bikeway Plan” (2000) by developing the “Non-motorized Transportation Plan” (a replacement plan which will also identify pedestrian projects – i.e. a bike/ped plan). The Non-motorized Transportation Plan is not yet final or adopted, but will be presented to the CORE MPO this summer for adoption. CORE MPO is the transportation planning board concerned with allocation of the federal transportation funds for the Savannah urbanized area, which includes all of Chatham County and portions of Effingham and Bryan counties.